A man whose eczema was so serious that he had to wear gloves day and night has had his life transformed after taking part in a trial of new treatments. Bill James was in severe pain with the skin condition for more than 10 years. In people with eczema, the body’s immune system overreacts and the inflammatory reaction can affect the skin. One in 10 people in the UK suffer from the condition on their hands, and for one in 20, it prevents them from carrying out simple everyday tasks. “At first it was just hard skin, but over a period of time it got progressively worse and started to split in several places,” said Mr James, who lives with wife Margaret. “It also itched like mad and made it very difficult to go about my daily tasks, especially with my work which involved making sheds and fencing. “I started having to wear gloves day and night, which was embarrassing, especially when meeting people, socialising and at work. The 65-year-old said he was never referred to a dermatologist by his GP, though he had various treatments. Enrolling on the ALPHA trial at the University of Leeds has made a “vast” difference to his life, Mr James said. The trial is comparing treatment with alitretinoin – a Vitamin A-derived drug in tablet form – and PUVA therapy, where hands are exposed to ultra violet (UV) light after they have been soaked in a solution called psoralen. 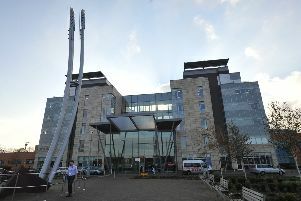 It is being led by University of Leeds researchers at Chapel Allerton Hospital. The father of two grown-up sons said the effects on his hands – and his life as a whole – had been massive. “I have been on the trial now for nine months and my hands are better than they have been for years.